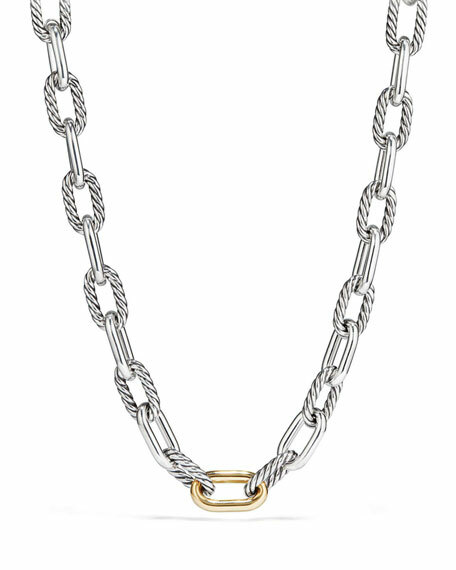 David Yurman Madison Chain 13.5mm Large Link Necklace with 18k Link, 18"
David YurmanMadison Chain 13.5mm Large Link Necklace with 18k Link, 18"
Madison large link necklace by David Yurman. Sterling silver polished and cable-motif links. One 18-karat yellow gold link at center front. In 1980, sculptor-turned-jeweler David Yurman introduced his eponymous collection. His artistic, sculptural pieces were a refreshing new interpretation, but David Yurman truly changed the trends of fashion with his now-classic twisted cable-inspired pieces. DAVID YURMAN "Tweejoux" necklace from the Cable Berries Collection. 18-karat yellow gold accents. Faceted pyrite beads. Graduated spessartite and rhodolite garnet stations. Approx. 36"L; may be worn doubled. Toggle clasp. Made in the USA. Madison medium link necklace by David Yurman. Sterling silver polished and cable-motif links. One 18-karat yellow gold link at center. Madison medium link necklace by David Yurman. Sterling silver polished and cable-motif links. One 18-karat yellow gold link at center. Integrated cable-push clasp. Approx. 0.4"W (11mm). 20"L. Imported. David Yurman necklace from the Mustique Tweejoux Collection. Sterling silver with black rhodium plating. Faceted hematite, reconstituted turquoise, and blue topaz beads. Approx. 62"L; may be worn doubled. Toggle clasp.